Those who play jazz have often expressed the feeling that it should remain undefined, that jazz should be felt. “If you gotta ask, you’ll never know,” said Louis Armstrong. There are two orchestras at SHS already, and director Scott Anderson said he had enough student musicians—well, almost enough—to create a third jazz band. The big bands of the 1930s would carry from thirteen to twenty-five musicians, and what works then, works now. “Typically we’ll have five saxophones—two altos, two tenors, and one baritone—five trombones, five trumpets, a bass, a guitar, a drummer and a piano,” said Anderson. That’s nineteen, and there is always room for one or two more. Sometimes the bands use a vocalist. 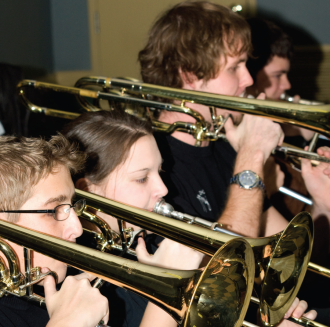 Denison’s Helen Moore carries on the tradition of Billie Holliday and Ella Fitzgerald when not playing trombone, and in Pottsboro, where students have a volunteer jazz group, Cammy Caldwell does the honors. Sherman’s jazz students get the opportunity to shine, says Anderson, during March and April competitions. They also perform at the school’s annual Spaghetti Dinner, and monthly, at the other schools in the city. Most notably, Sherman’s jazz students attend a week-long clinic and hold a concert every April with a guest artist. This year’s guest artist is Shelli Burg, a pianist, from the University of Southern California in L.A. The clinic closes out on April 25 with a concert and fundraiser. The money raised at the event, along with funds from the Sherman Education Foundation, is used to purchase new music and to host talented musicians such as Berg. Denison High School sophomore, Tim Hoover, won his school’s Louis Armstrong Award. Denison has one jazz band and may add another if interest warrants. 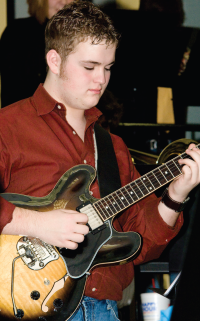 The standout with the Yellowjackets is sophomore guitarist, Tim Hoover. In his freshman year, Hoover won the school’s Louis Armstrong Award. He also plays with The Blu Rock Band, a family enterprise, which is fast becoming a big noise in local hot spots. Hoover’s solo at this year’s Neewollah (Halloween spelled backwards) Concert at Denison High School blew the audience away. He snuck in snippets of movie and television soundtracks to whatever he was playing, and with a discerning ear, you could hear two riffs playing at once. Jazz is not really for lazy listeners. “Exactly,” said director Onspaugh. “Jazz is for the more involved listener!” Face it, you gotta be smart to be hip. “Jazz definitely won’t come and go like disco,” Onspaugh said. He regards the public high school arena as an important venue for keeping jazz alive in the United States and for passing along this most American of musical forms, with all the complexities, the metamorphoses, and the journey that are its legacy, from generation to generation.